Another week in the books folks. Spring is mostly here (except for a few of you up north) in the country as Major League Soccer inches closer to the month of May. Week 8 saw its first double dip for two clubs while once the dust settled the standings resembled a bit of the same that we saw going into the week with FC Dallas still on top. Still, after the first few teams in the standings, there is a massive log-jam of clubs with only a point or two separating them from one another. We do however have a new club in last place but I’ll get to that in a moment. Here is what I saw in each game this past weekend (note: I’m leaving out the midweek game for now, enough time has past on that one). – A fairly “blah” kind of game. It was cold and nasty in Toronto and the play suffered because of it. – I thought the red card in the second half would have changed the game for good in terms of allowing Toronto to get the three points but boy was I wrong. Toronto is still searching for their first home win since last July. This was really a game that Toronto should have won given all the circumstances. – The late game-winner by Warren Creavalle was pretty nice. I have to say the more I see Creavalle the more I am intrigued by this guy. He’s great a times and then stumbled the rest of the time. Still good for someone to step up with Brad Davis out. – Obafemi Martins’ first MLS goal wasn’t pretty but for a big named foreign guy, he’ll take it. So will Sounders fans. Probably the best way to get that monkey off his back. Now if he can continue to produce goals and do his back flips, Seattle will be in business here. – Colorado did what Colorado does in this game. Controlled the possession, created the chances but once again came away with little to show for. Until this club is healthy, it will just continue to be agonizingly tough to watch this club. – This was a game that you saw the dominance of Osvaldo Alonso in the midfield. Sure was going up against a rookie for some of it in Dillon Powers but Alonso was calm on the ball and won a ton of battles. Also, I think he and Shalrie Joseph are starting to form a nice partnership in the midfield. I like where that is going for Sigi Schmid and the Sounders. – Tough game for the Revs. Really, really tough game. A wild couple of minutes early on put them behind the eight ball and then a couple late goals pretty much killed off the game for them. They had some chances but when the offense fails to convert the few chances that are there on the road, it will make for a brutally tough game to watch. 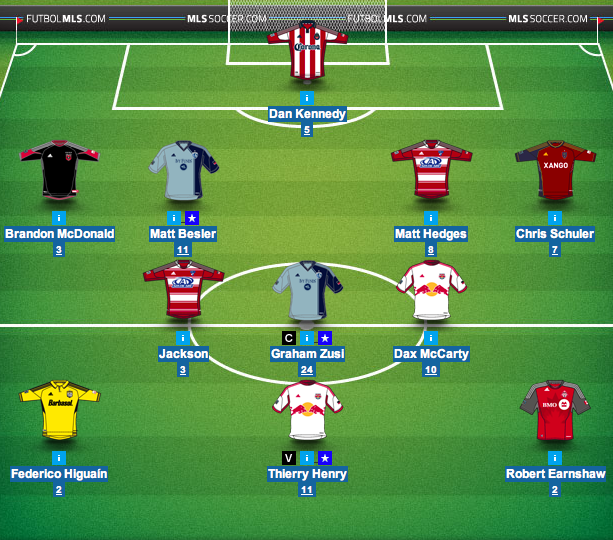 – Dax McCarty probably had his best game to date this season for New York. Controlled the midfield, got a goal, and helped create other chances for the attack. Not bad out of a defensive midfielder. – This is the kind of offense we should expect out of New York each night. Loads of chances and quality players finishing those chances. This easily could have been an even bigger blowout in my mind. – Kudos to the two supporters groups before hand coming together to show their support for Boston. Well done. 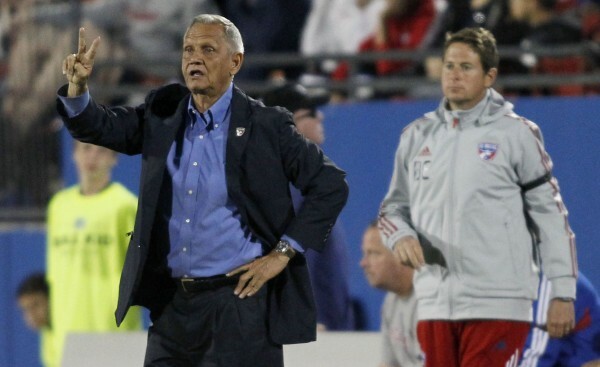 – Another win and shutout for FC Dallas. At 6-1-1 on the season, they are starting to become more impressive by the week. Just for perspective purposes here, Dallas didn’t get their sixth win last year until August. Yeah. August. 19 points for Dallas didn’t come until August. And…they had six shutouts all of last year, right now they have five. – Probably the most complete game from Dallas this season. No one stood out more than the other. No one had a truly bad performance. It was easy to see that Vancouver clearly didn’t have enough to handle the speed and pressure up front in this one. – These two play again in Week 9 at Vancouver. You do have to wonder how much the Caps will have for that one given how they have an important Canadian Cup match in Edmonton on Wednesday night and will have the follow up game in that series next Wednesday. Does Martin Rennie save his squad for that or do some more mix and match like he did in Frisco? – Some would say this was the shocker of the weekend but let’s be honest here, the Fire aren’t a bad team here. I think Jeff Larentowicz is finally getting comfortable in the Windy City and the results are starting to show for it too as the Fire have gone unbeaten in their last three. – Columbus Crew goalkeeper Andy Gruenebaum had one of his usual massive games. Had the scoreline gone the other way in the Crew’s favor, you’d probably see more votes for him this week in the Player of the Week ballot. – This was a defensive battle if there ever was one. Austin Berry showed us once again why he won Rookie of the Year in 2012. Just a dominant effort by Berry. – A wild one that saw Nick Rimando save a penalty kick and Javier Morales score a game winner late. – The high-risk, high-reward style of play out of Chivas doesn’t work against teams like RSL, at least not for 90 minutes. RSL controlled the possession from the start and thanks to the amount of space that RSL created through the midfield, really kept Chivas from getting control of this game. – Chivas got some chances in the second half and in a way showed how dangerous for moments of the game that they can be. But Nick Rimando was a beast on Saturday evening. Chivas just didn’t have the finishing touch to get anything by him on the night. – Tough to do the NY-to-LA swing in one week but Sporting KC gave it their all in this one. SKC rarely had opportunities in this one to press the back four of LA. Pretty typical given the travel of the week. – Landon Donovan is quickly looking like his old self here. One goal, one assist on the night. Probably the best we’ve seen out of him since the summer of last year. If he is only at say 70 or 80 percent right now, things look very good for LA moving forward. – Let’s be honest though, the return of the dominant back four for LA (Franklin, DeLaGarza, Gonzalez and Dunivant) was the difference maker in this one. As good as Sporting KC has been defensively this year, it may be tough to match what those four bring to the table as a group. – Jack McInereny’s brace was fun to watch. Hell, this kid is just fun to watch in general. – Probably the first game all season that United can really blame their defense for the loss. Bad timing to come up with that as well given how United are now sitting in dead last in MLS. Ouch. – If the Union can correct some of the defensive mistakes from this game, they could be a very sneaky and fun team to watch here. They have the talent for sure to do damage but keeping it consistent is key. – Porterball nearly wins out but San Jose’s late magic shines through yet again. Against better teams, San Jose doesn’t win this game. Simple as that. – The style of play from San Jose is getting more annoying to watch though. Steven Lenhart does the dirty work in this one but nothing about how they played showed that they would win this one. Portland dominated the possession game and created loads of chances. I’m still not completely sold on this San Jose team doing that well this season. – Jack Jewsbury in the defense? Sometimes moves like that just work. Caleb Porter is pulling some of the right strings right now and his club is a lot of fun to watch because of it. Diego Valeri finally had a good game, probably his best since the opening week of the season. As a die-hard fan of the San Jose Earthquakes I hate to say it but annoying is absolutely how I would describe the style of play of the current Earthquakes. There was no lack of people talking up the Quakes last year, but I often wondered how long the “magic” would last. It failed in the playoffs. And it is failing again this year. The embrace of Lenhart’s physical play is fine to a certain extent but there definitely needs to be more to it than that. Lately all I see is stupidity rising from frustration and a lack of control of the ball. I really disregarded the comments about Yallop’s success with the first iteration of the Quakes being highly indebted to Dominic Kinnear. But the more I see Houston succeed and San Jose sputter it’s hard for me to ignore that argument. For years “bootball” seemed to be Yallop’s MO. When that started to fade last year he said it was because they now had players that could control the ball. But now that ball-handling has gone down and the players are mostly the same what’s the excuse?